The Centre Spot is an outstanding and unique venue which prides itself on catering for all your requirements whilst meeting your high expectations. 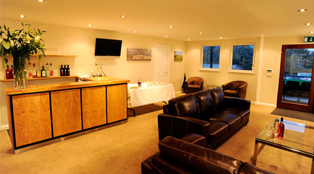 You can enjoy exclusive use of our facilities and are guaranteed a warm welcome and professional service. Our experienced venue manager and team will be on hand to help with all aspects and arrangements of your event, ensuring that you and your guests enjoy the time that you spend with us. 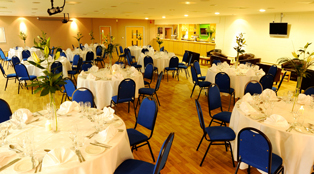 Our excellent facilities include The Centre Spot which is ideal for larger meetings, conferences, parties, fine dining and exhibitions and The Directors and Dennis Hammond Suites, which can accommodate smaller numbers for both business and special occasions. We offer a selection of menus to suit all occasions and budgets and would also welcome the opportunity to help you create your own menu for that very special occasion. Our meeting rooms are equipped with fully-integrated audio/visual system, including two large wall mounted LCD displays. 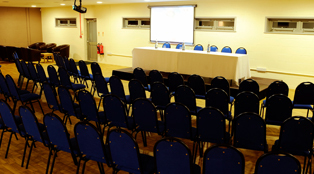 Facilities are available for injection of laptop and DVD presentations and we also have a range of conference, event and production equipment available for hire. You will find us situated in the grounds of Dover Athletic Football Club's Crabble Stadium which offers excellent parking facilities and disabled access with the nearest train station only a 10 minute walk away. Please do not hesitate to contact our venue manager to discuss your individual requirements or arrange a visit to check out our first-class facilities which are sure to meet your every need.